Healthcare transformation has been underway for a longer period than many recognize, and it certainly began well in advance of the hi-tech initiative and government inspired “Healthcare Reform.” For example, in 2004 a leading health plan initiated research and development of the model illustrated in Figure 1, with the key interest being movement toward a retail-inspired model. The concept innovation was about taking our traditional healthcare supply chain and modeling it after a point-of-sale (POS) retail operation. Several analogies were discussed, one being like going to a restaurant. The dining out experience consists of the customer selecting the restaurant based upon what they want to eat, how much they want to spend, convenience of location, etc. The debit and credit cards accepted by the restaurant are typically displayed in the front window along with the menu including cost. When they have finished dining, the services are paid and there are no complicated post-service collections, billing, denial management, etc. The next dining experience, the customer is free to select a totally different restaurant with similar experience. During this study, convenience of access was identified as key by both patients and providers. Input from a younger population (18-35) was that they should be able to get basic (internal medicine) services from several points of convenience that they routinely visited for other purchases. This POS type model was not seen (in 2004) to be as complicated as it first seemed, at least operationally. The challenge was in collaboration across an infrastructure to be shared by a retail operation, including both its retail and pharmacy operations, a group of providers consisting mainly of Nurse Practitioners and Physician Assistants, and a health plan. Revenue cycle operations were also key to the collaboration model. It was seen that this model could be put into operation for Internal Medicine and Family Practice service lines, and relatively quickly be expanded to include services for some chronic conditions such as diabetes and asthma. In April of 2012, Becker’s Hospital Review predicted the future of U.S. Healthcare and cited, “providers are moving to a consumer-oriented approach for care. The consumer-oriented model – convenient access – is really a retail model in terms of placement of services1.” They also cited that there needed to be a recognition by hospital-based healthcare systems that their focus was to shift from filling beds to emptying beds. Therefore, the success of a hospital-based health system was dependent upon successful partnering with pre-acute and post-acute providers and transformation of their service model. In addition, they predicted that there were three keys to this transformation: retail models, population health, and service line acquisitions. Relate this last prediction to the recent CVS and Aetna merger. It appears that they can fulfill all three of these areas for their members and employees; at least for ambulatory care, pharmacy, revenue cycle, and other retail services. CVS is one of the largest U.S. retailers with over 10,000 retail stores. They are one of the largest Pharmacy Benefits Managers and prescription drug distributors, and in addition will likely aggressively grow their Minute-Clinics which are already 1,500+. Aetna is a leading commercial health plan provider who has aggressively built solid provider partnerships, has been a leader in accountable care and care management, and can instantly bring 23 million+ medical members to a retail-model network. 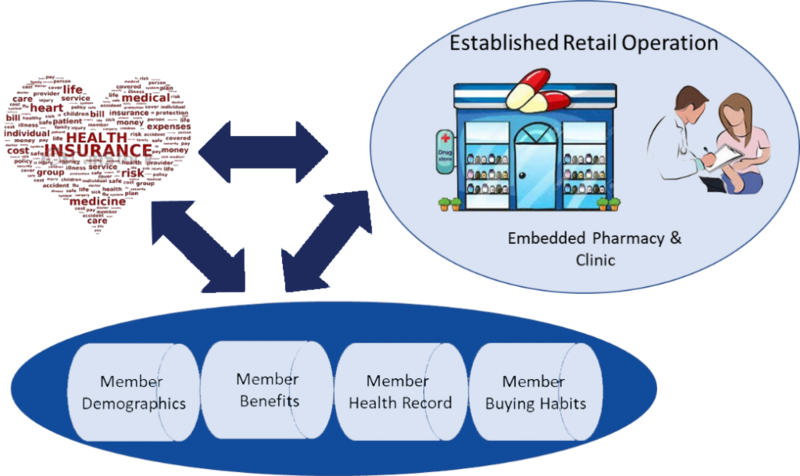 The relational analytics for demographic, benefit, clinical, prescription and over-the-counter pharmaceuticals, and other retail buying habits for their members will be a tremendous advantage. This model may prove very attractive to new members, both commercial and Medicare/Medicaid covered (if CVS/Aetna take advantage services that direction) who are looking for convenient access, likely low cost for ambulatory and pharmacy benefits, and an easy pay/retail shopping type experience. It will be interesting to watch this unfold over the next 1-2 years, and to see if this pressures others to try and follow suit.